The publishing company Camden Communications Inc. (CCI) once sold the front cover to a major advertiser, in this case, Traveling Software Inc. The Cover-One ad referenced an existing ad spread on Cover-Two and Page 1. As a junior staff editor at CCI, I can state that it was the publishing company, not the advertiser, who instigated this particular transaction; it was a desperation ploy to raise cash. The cover was sold just before before we went to press, replacing an ordinary editorially driven cover. This was the last issue of Portable 100 published by CCI, which shut down in early 1987. Portable 100 was later purchased by IDG and resumed publication in August 1987. 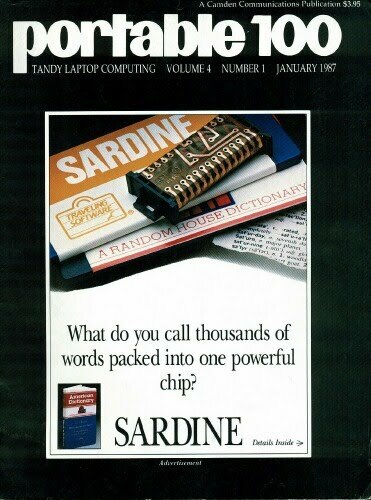 The advertised product was a ROM chip for the Radio Shack TRS-80 Model 100, which provided it with an English language dictionary.